Home » MGX Copy News, Print Design Best Practices, Print Products & Options	» Where can I get perfect binding services? 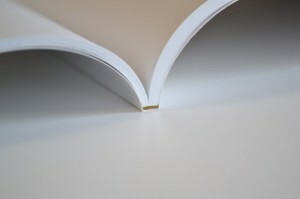 If you’re not familiar with all the types of binding but need to get a print job bound, you might want to take a look at perfect binding services. Perfect binding services are one of the many different types of binding applications that can be used to bind your printing project together. This article is designed to help you better understand and determine where you can get perfect binding services near you. What are perfect binding services? There are many different reasons why someone might want perfect binding services. It could be that someone wants their pages to have a more professional, “book-like” appearance. Or, it could be that someone is printing a comic book or graphic novel. In that case, many long form comic books and graphic novels use perfect binding services so that there is plenty of room to write the publication and author’s name on the spine of the perfect bound book. The best place to get perfect binding services is at an online printing company. Instead of overpaying for perfect binding services, save money by avoiding outrageous Kinkos printing prices or exorbitant Vistaprint prices. Instead, go with an online printing company that will save you money by providing an exceptional quality and service to your printing experience. You won’t be disappointed! Contact us for perfect binding services today! Contact us at MGX Copy to get perfect binding services for your next printing project. Plus, if you need your prints quick, you can take advantage of the Rush Critical shipping option. Rush Critical jobs are generally printed and shipped same-day/next-day. It’s the absolute fastest online printing service available in the United States.